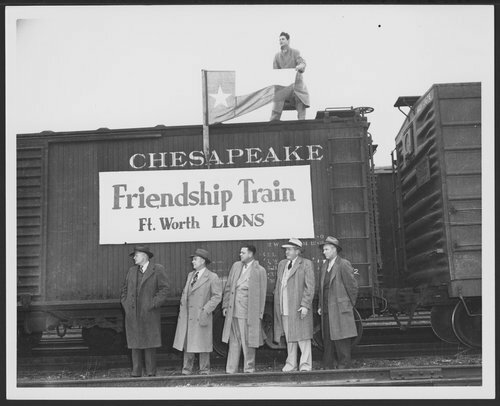 These five black and white photographs show the Southwest Friendship train in Wichita, Kansas. The eleven day cross country trip was organized by broadcaster and columnist Drew Pearson. He encouraged American citizens to donate nonperishable food and supplies to the people of post-war Europe. The train began in Los Angeles, California, and crossed through eleven states before reaching its final destination in New York City. Every state in the union including the territory of Hawaii made a contribution to the effort. In the first and second photograph, Irvin Farman from the Fort Worth Star Telegram is holding the Texas Flag. The gentleman from left to right are: E.A. Wier, general yard master of the Santa Fe, Wichita; S. Greenwood, trainmaster of the Santa Fe, Newton; Marlowe Fisher, state secretary of Lions Club; Roy Denton, city freight agent of Santa Fe, Wichita; and Ray Brown, circulation department of the Wichita Eagle. The third photograph shows from left to right: C.L. Davis, assistant general freight agent of the Santa Fe; Earl Weir, general yard manger Santa Fe; Roy Denton, city freight agent; H.A. Rupe, division freight agent of the Santa Fe. The fifth photograph shows Marcellus M. Murdock, publisher of the Wichita Eagle, at a ceremony honoring the event.